Calico Jack's Pirate Raiders is all about humans and zombies, and no set sums that up better than this one. Captain Vanes' right hand man. They were inseperable until a shipwreck lead to Vanes' stay on the island hand his slow descent into madness. First Officer Deal's skill and cunning as a master tactician lead to many successful raids for Vanes' crew! 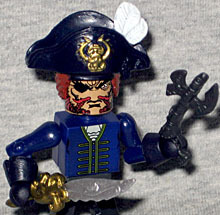 If you just looked at the designs of Art Asylum's pirate Minimates, rather than reading the bios on the back of the cards, no one would blame you for thinking Robert Deal was the main character - after all, he has the fanciest clothes, and he wears the biggest hat. But no, it turns out he's just a villain. And more than that, second banana to the real villain. The unempowered human second banana to the magical zombie villain! So does that make him lame, or does it mean he's badass enough to hang with Vanes' crew without any special treatment? Make up your own story - it's not like the one AA made up has any more specific info about him, so go nuts. That giant hat is part of the figure's hair piece, naturally, but the final sculpt is more ornate than the prototype: a fancy ribbon has been added on one side! He has a big red beard, but it's all done with paint rather than being sculpted (despite the fact that it looks just as bushy as Vanes'). He also appears to have braided part of his mustache. 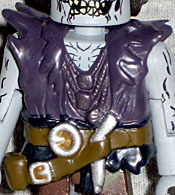 Unlike Rustin, I don't hate Minimates that have ornate sculpted pieces. Not crazy about them, but I can deal - as long as those pieces don't get in the way of the articulation. Guess what we're going to say about Deal's add-ons in the next sentence. Robert Deal's coat has a very detailed sculpt, which would be fine if it didn't get in the way of he articulation. He has an ankle-length blue coat with a (surprisingly separate) purple cape, several belts and sashes, a powder horn hanging at his waist, and skulls with gold fringe hanging from them on his shoulders. If you take the coat off he has a more normal dress shirt on beneath it, but man is that coat a huge piece, and it totally keeps his legs from moving the way they should. Robert Deal has two accessories: a ragged silver sword with a golden starfish hilt, and a black double-barreled gun with ornate axe blades coming off the top and bottom. 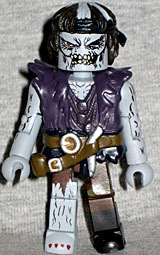 And yet it's not the same axegun that came in the Calico Jack/Tom Brown set! The blades and handle are molded with tiny pirate symbols, too. And unlike many of the figures, Deal's sword faces the right direction! That's a victory! Formerly a Privateer, Nicholas found pirating more profitable and to his liking than the merchant trade. He was a very successful pirate until gripped by an infection that many say was caused by a cut from Calico Jack's cutlass. He was deceased for some time before Vanes "revived" him. If that's true, then Calico Jack was quite the prodigious youth! In the real world, Nicholas van Hoorn died in 1863; no one is really sure when Jack Rackham was born, but it was most likely sometime in the year 1862. And really, I know children had to grow up faster back then than they do today, but what kind of irresponsible parents give a cutlass to a 1-year-old? Of course, the bio just says "Calico Jack's cutlass" - maybe they litearlly mean that specific sword, and it was handed down to Jack later. 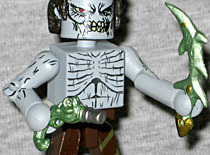 Luke's Toy Store may have offered a Zombie Decal Kit, but Nick, here, is the first official Minimate Zombie (ie, the one with no connection to Marvel). His face is gray and wrinkly, he has one eye and no lips. The scalp has weird stripes, but I think they were trying to convey thinning, balding hair. Doesn't quite work. van Hoorn is wearing a sculpted vest, and beneath that is a dessicated ribcage. One leg of his pants has been torn away, and he's short a boot, so you get to see his claw-like toenails. The vest is molded with ragged edges, and there are two three (unpainted) medallions that fall against the wearer's chest. There's a belt with silver buckles, and a non-functioning baldrick or holster on the right side. And is that a dagger or something else stuck into the front of the belt? 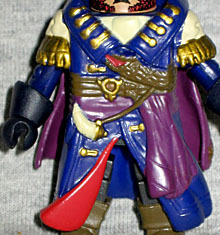 The figure is armed with a sword and a pistol, designed to look like a matched set. They're a slightly metallic green, which sets them apart from every other weapon included with Series 1. The flintlock pistol has an ornate, carved handle with a hook at the end, and the sword has jagged spikes coming off its curved blade. They're both very cool weapons with just the right level of "unearthly" design to make them look like they belong to someone who's no longer human. 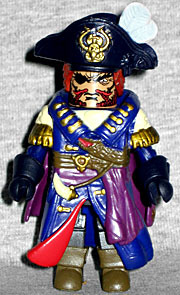 This set is a good example of the general quality of Calico Jack's Pirate Raiders Series 1: figures with impressive designs, but that stray a little too far to the "sculpt" side of the sculpted/painted divide. They're good, but there are issues that can't be overlooked or ignored that keep them from quite reaching their true potential. So let's see Calico Jack's Pirate Raiders Series 2, and maybe those problems can be fixed.